Virginia Attorney General Ken Cuccinelli is investigatiing former University of Virginia professor Michael Mann for misuse of public funds. In response, the American Association of University Professors and a substantial number of Virginia scientists and academics oppose Cuccinelli’s investigation. However, the misconduct of which Mann is accused cannot go without investigation. It is essential that citizens insist on transparency, integrity, credibility and accountability in the climate change arena. The Climategate emails revealed another deliberate “trick” that Mann used to generate a late twentieth-century temperature jump: he replaced tree ring data with thermometer measurements at the point in his timeline when the tree data no longer fit his climate disaster thesis. During his UVA tenure, he employed other statistical tricks to generate an accelerated warming trend of 2.0°-4.5° F per decade (1.0°-2.5° C), as shown in his 2002-2003 publications. That extrapolates to as much as 45° F per century! Figure 1. 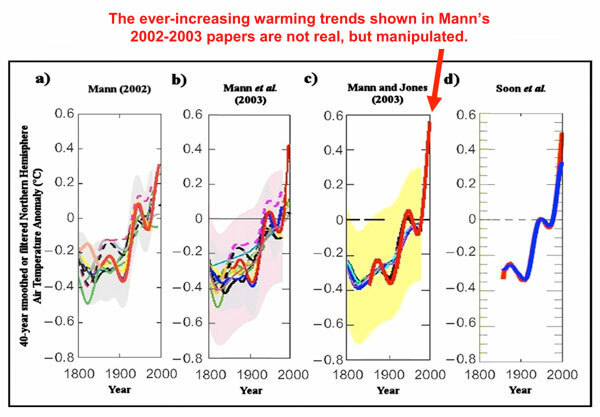 Chart from professional paper analyzing Michael Mann’s “hockey stick” graphs that purported to find average global temperatures suddenly skyrocketing at an exponential rate in recent decades. Willie Soon, David Legates and Sallie Baliunas, “Estimation and representation of long-term (>40 year) trends of Northern-Hemisphere-gridded surface temperature: A note of caution,” Geophysical Research Letters, Vol. 31, 2004.